fromReason: Even when Americans don't love their political allies, they hate their opponents. fromTheFederalist: Tolerance is one of the most important and enduring American values. If we lose it, we lose almost everything. fromAmericanGreatness: The result of a progressive wolf baying proudly as a left-winger is that as we head to the 2018 midterm, progressives may soon blow what should be a big win for the out party in any president’s first term. fromCBSNews: Why smart shooters choose gun-free zones. fromReason: Ballot initiatives in Michigan, Missouri, North Dakota, and Utah will give voters a chance to loosen their cannabis laws. fromStatelessLiberty/YouTube: Are you brave enough to answer the question posed by this video? 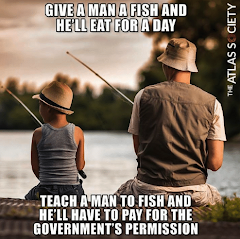 "The Tale of the Slave" features in Robert Nozick's book, "Anarchy, State and Utopia"
fromMises: One of most fascinating aspects of progressives is the blindness they display to the adverse consequences of their very own government programs. fromLibertyPen/YouTube: Charles Murray puts forward a strategy to confront regulatory state tyranny. fromReason: Just days after the latest CBO projections showed the deficit getting worse, Congress signs off on another bi-partisan spending increase. fromEFF: The upcoming hearing at the Senate Commerce Committee may be the launch pad for this strategy of undoing stronger state laws. fromReason: A father of three and a Navy veteran was gunned down by two police officers as he tried to be a good Samaritan and break up a fight outside of a Portland bar. As usual, the cops are excused of accountability. fromReason: The video within the article is evidence of the tech elitists who believe they should control what citizens see in searches so that Trump's trashed and all the successful things go unseen. fromTheWashingtonTimes: The whole purpose of the Constitution is to restrain the government and to protect personal liberty. FISA and its enablers in both major political parties have done the opposite. fromLibertyPen/YouTube: Professor Williams explains what drives the political world. fromBusinessInsider: Apple does not have this problem because they sell directly to customers. Their customers want privacy. Android phones are sold to service providers and service providers like data collection. fromTheNewYorker: A new generation of American kids embraces firearms. fromQuillette: Every new point of view we encounter can enrich our understanding even if we don’t embrace it entirely. But this comes with the risk of self-effacement and growing uncertainty. VIDEO: Donald Trump - Compromising With The Devil? Walter E Williams: Liberal Reasoning - Idiotic or Dishonest? VIDEO: Charles Murray - Who Killed The Constitution?